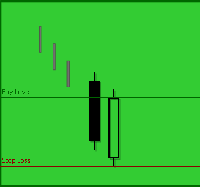 A short day represents a small price move from open to close where the length of the candle body is short. 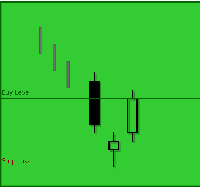 A long day represents a large price move from open to close where the length of the candle body is long. 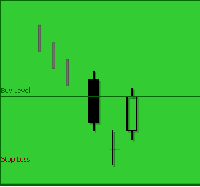 This is a five candlestick pattern that starts with three strong white candlesticks. The uptrend continues with the fourth higher close. The next day gaps lower and closes much lower than the previous day or two. This may imply a bearish reversal. 2. Three strong white candlesticks occur much like the Three White Soldiers pattern. 3. 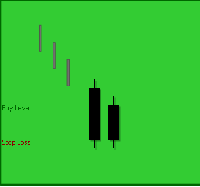 The fourth white candlestick closes also higher but has a long lower shadow. 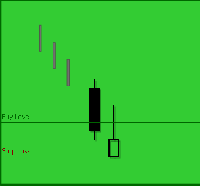 This is not a standard candlestick pattern. It is simply the stop loss compliment of all the confirmed bearish patterns. The conditions for the activation of the Bullish stop loss are two consecutive highs or a close above the stop loss level of a recently confirmed bearish pattern. 1. A bearish pattern is detected and its confirmation and stop loss levels are established. 2. The pattern then is confirmed and a SELL or SHORT signal is issued. 3. 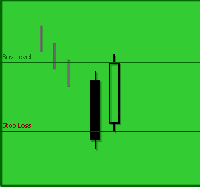 Prices either close once above the stop loss level or test highs above the stop loss level in two consecutive days. 4. The Bullish stop loss is triggered. 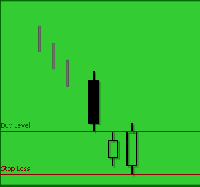 All bearish candlesticks are accompanied by a specific stop loss level which becomes active when the pattern is confirmed. A bearish confirmation consequently may lead to a bearish signal such as a SELL or SHORT signal. Following the bearish signal if prices go up instead of going down and close or make two consecutive daily highs above the stop loss level while no bullish pattern is detected then the stop loss is triggered. Once triggered the stop loss level of the recently confirmed bearish pattern starts acting as the confirmation level of a bullish pattern itself. The system then seeks a bullish confirmation to issue a BUY signal. 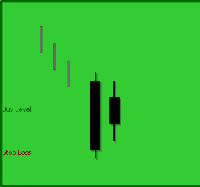 Prices must cross above the stop loss level for the bullish confirmation of the triggered stop loss. 1. The market is characterized by a prevailing uptrend. 2. A strong white candlestick appears on the first day. 3. The second day is a black candlestick that gaps up. 4. On the last day another black candlestick appears that opens inside the body of the second day and then closes inside the body of the first day. The Bearish Two Crows should start with a strong white body. A black body that forms an upside body gap with the first candlestick follows. The third day is another black body that opens at or above the close of the second day. The third day should close within the body limits of the first day. 3. On the second day we again see a white body which is completely engulfed by the body of the first day.